Growing habit in the Richterweld, north-western South Africa. 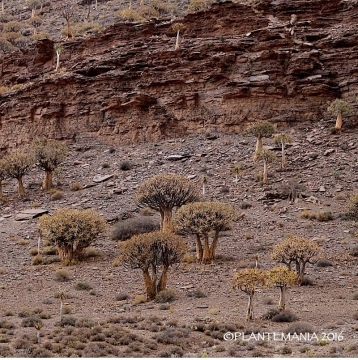 Origin and Habitat: South Africa northern Cape region and Namibia. Namaqualand and Bushmanland. from near Nieuwoudtville northwards into Namibia and eastwards to Upington and Kenhardt. Habitat: It occurs in desert and semi-desert rocky areas where it receives rainfall, if at all, in the winter. It mostly occurs in black rock formations (called ''ysterklip'') which absorbs a lot of heat during the hot summer. (Average summer temp. is 38°C). The rocks anchor the plants which have a spread-root-system. The quiver tree is proof against frost. Ecology: The copious nectar of its blossoms draws birds and insects as well as baboons that can strip a tree of its flowers in a short time. Being one of the only tree forms in its arid habitat, Aloe dichotoma oftentimes plays host to huge colonial nests of social weaver birds. The plants are usually found growing singly but in some areas the plants grow in large groups, giving the effect of a forest. Aloidendron dichotomum (Masson) Klopper & Gideon F.Sm. Aloe dichotoma subs. ramosissima (Pillans) Zonn. Bradleya ( Pillans ) Zonn. Aloidendron ramosissimum (Pillans) Klopper & Gideon F.Sm. 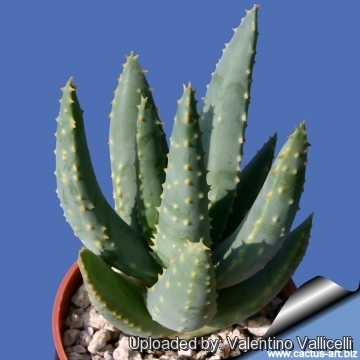 Description: It is probably the best known aloe that form an extremely tough tree with densely rounded crown as a result of the repeatedly forked branches. 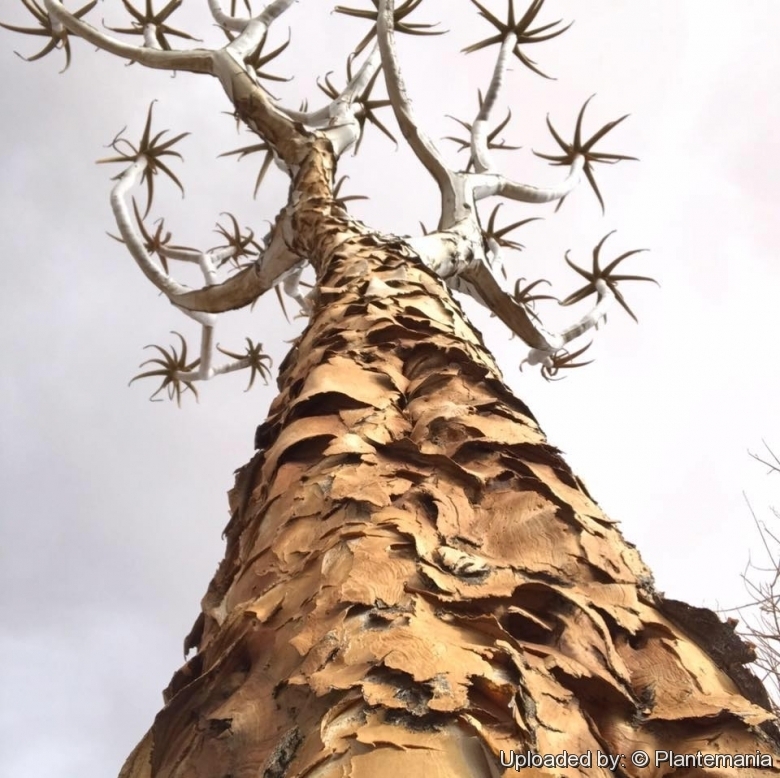 It is one of the biggest members of the genus Aloe and may reach an age of over 80 years and a height of approximately 7(-9) metres with up to 1 m of diameter at ground level. 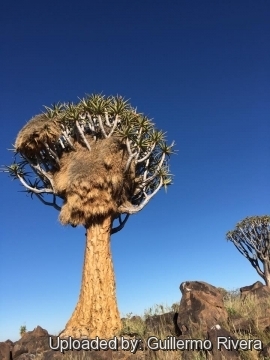 This is one of the most branched and tree-like species of aloe. Stem: Smooth, covered with a thin layer of whitish powder that helps to reflect away the hot sun's rays. Typically, the trunk tapers from a thick base towards the top and begins to branch and re-branch dichothocomously at about half way up the trunk, earning the plant its specific epithet for this dichotomous pattern. The bark on the trunk is rather hard and forms beautiful golden brown scales, but beware, the edges of these scales are razor sharp. The pith is soft, light and spongy. Leaves: About 30cm long and 5cm wide, blue-green, fleshy, bearing a narrow brownish-yellow margins margin of thorns. Leaves are arranged in a spiralled terminal rosette in old plants, but in juvenile plants they are ranked in vertical rows. These rosettes at the tips of the forked branches usually form a dense, rounded crown. In this species the old dry leaves drop off so that the leafy rosettes only remain at the tips of the branches, leaving the rest of their length clean. Roots: It has a spread-root-system the roots are somewhat fleshy. Flowers: The flowers are branch panicles up to 30 cm tall from the base of the peduncle to the apex of the terminal of the raceme. They are bright canary yellow, held close to the leaves, at the tips of the branches, and are fairly short and carried erect. The flowers are rather short and rounded in shape and not nearly as showy as many other species of aloes. Blooming season (Europe): Flowers are borne in winter (December to January). They have their first flowers when they are about 20 to 30 years old. 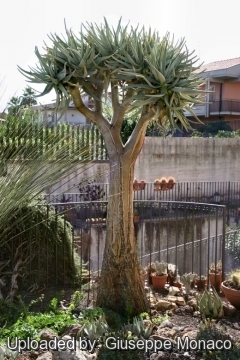 Aloe dichotoma Masson: is a tree with rounded crown and may reach a height of 7 metres with up to 1 m of diameter at ground level. Distribution: South Africa (northern Cape) and Namibia. Aloe dichotoma subs. ramosissima (Pillans) Zonn. : is a slow growing small tree or shrub type aloe known for its many branches and smooth, white stems. 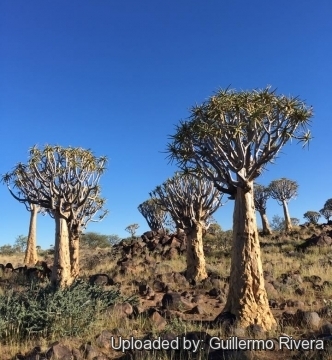 Distribution: Southern Africa (Richtersveld), southern Namibia. 5) Gibbs Russell, G. E., W. G. Welman, E. Reitief, K. L. Immelman, G. Germishuizen, B. J. Pienaar, M. v. Wyk & A. Nicholas. 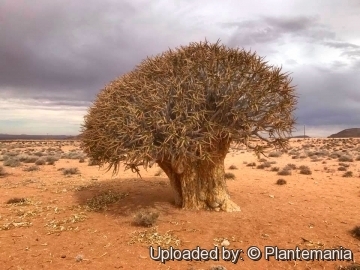 "List of species of southern African plants." Mem. Bot. Surv. S. Africa 2(1–2): 1–152(pt. 1), 1–270(pt. 2). 1987. 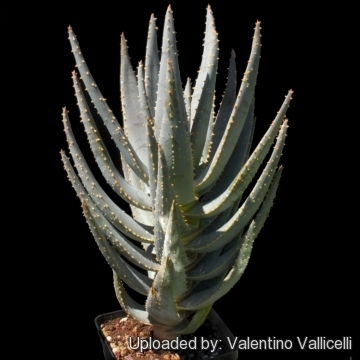 Cultivation and Propagation: Aloe dichotoma is an attractive and interesting accent plant to have in a sunny garden. It easy to grow and suited for any well drained soil in full sun. As such it is increasingly used as an ornamental plant for drought tolerant landscaping and rockeries. Growing rate: It grows slowly, but not agonisingly so – being able to increase its height by 10-20 cm per year under favourable conditions. It is a long lived plant and once established, it will be content in its position and with its soil for years. It is often in danger of being overgrown, smothered and killed by faster growing plants in its vicinity. Soil: Always use a good quality, loamy sandy soil with plenty of drainage chips at the bottom of containers. It prefers soil of a medium or slightly acidic pH. Fertilization: It needs a perfect fertilizer diet in summer. Use preferably a cacti and succulents fertilizer with high potassium content including all micro nutrients and trace elements or slow release fertilizer. Exposure: It can tolerate moderate shade, and a plant that has been growing in shade should be slowly hardened off before placing it in full sun as the plant will be severely scorched if moved too suddenly from shade into sun. Watering: It tolerates weekly watering in the summer; once a month, or not at all in the colder months of winter. Can withstand long periods of drought, but they will thrive and flower more profusely if watered in the correct season. Pest & diseases: Incorrect watering, poor drainage or too much shade can lead to attack by pests and diseases. 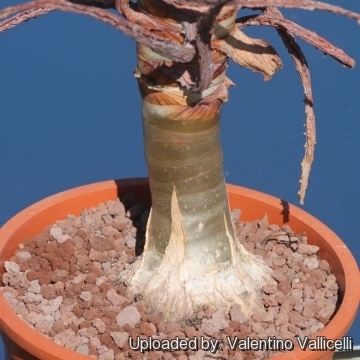 Rot it is only a minor problem with aloes if the plants are watered and “aired” correctly. If they are not, fungicides won't help all that much. Hardiness: It can take a few degrees of frost in winter as well, but prefers hot summers. It grows much better outdoors in spring and summer. Gardening and landscaping: In mild climates it can be cultivated outdoors for use in landscaping, preferably planting it in hot and dry rock gardens. It will grow best in regions with a climate close to that of its native deserts – not too cold, and not too wet. It can be grown in large containers too. Edible uses: The young flower buds can be eaten and have a similar appearance and taste to asparagus. Propagation: By seeds planted in autumn, in trays of coarse river sand. Cuttings can also be used for propagation. Cuttings must be dried out for at least 3 weeks before planting in river sand. Growing a mature plant from a seedling or single stem cutting would be a lifetime's work but by good fortune larger cuttings, sometimes known as truncheons with several branches and leaf-rosettes, can be rooted, but this may take several months and success is not always guaranteed.